Israel's attorney general on Thursday recommended criminal charges against Prime Minister Benjamin Netanyahu in a series of corruption cases, shaking up an already tumultuous election campaign and threatening to end the Israeli leader's decades-long political career. The potential charges stretch across an array of embarrassing scandals that have painted Netanyahu as a hedonistic, and sometimes petty, leader with a taste for expensive gifts and an obsession over his public image. They include allegations he accepted hundreds of thousands of dollars of champagne and cigars from billionaire friends, and allegedly used his influence to help a wealthy telecom magnate in exchange for favorable coverage on a popular news site. While a final decision on charges is still months away, Attorney General Avichai Mandelblit's recommendations threatened to hurt Netanyahu's standing in the heat of a tight re-election battle. Netanyahu quickly faced calls to immediately step aside while he deals with the distraction of trying to clear his name. Appearing on national TV late Thursday, Netanyahu dismissed the allegations as an "unprecedented witch hunt" by political opponents intent on seeing him lose the April 9 election. 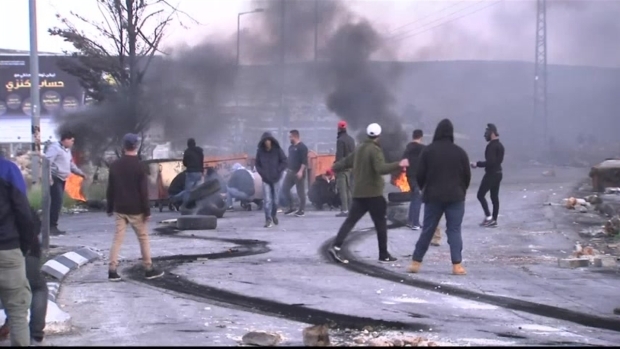 Reacting to President Donald Trump's recognition of Jerusalem as Israel's capital, Palestinians are protesting in cities across the West Bank and Gaza Strip while Israeli Prime Minister Benjamin Netanyahu called Trump's actions "a milestone." He called the timing of the recommendations "outrageous" and accused prosecutors of caving in to pressure from "the left." Appearing emotional at times, he called the case a "blood libel," said he would debunk all charges and vowed to remain prime minister for many years. "This house of cards will collapse," he said as he addressed voters. "Don't let this witch hunt affect you." Mandelblit announced his recommendations after more than two years of intense investigations and deliberations by police, legal experts and financial regulators. "The attorney general has reached his decision after thoroughly examining the evidence collected during the investigations," his statement said. Netanyahu was not formally charged. Under Israeli law, he is entitled to defend himself at a hearing before charges are officially filed. That process is expected to take many months and be completed long after the election. Tomer Naor of the Movement for Quality Government, a watchdog group, said the hearing process could take about a year. While charges are not guaranteed, he said most of the cases, particularly the bribery case, appeared to be solid. 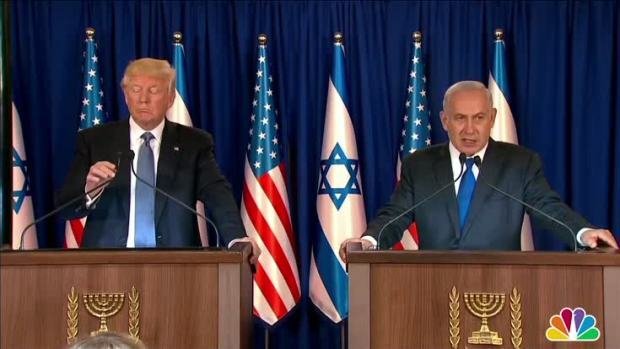 U.S. President Donald Trump and Israeli Prime Minister Benjamin Netanyahu discussed the strength of the U.S.-Israel relationship, the international nuclear deal with Iran and Middle Eastern stability at a joint press conference in Israel on May 22, 2017. 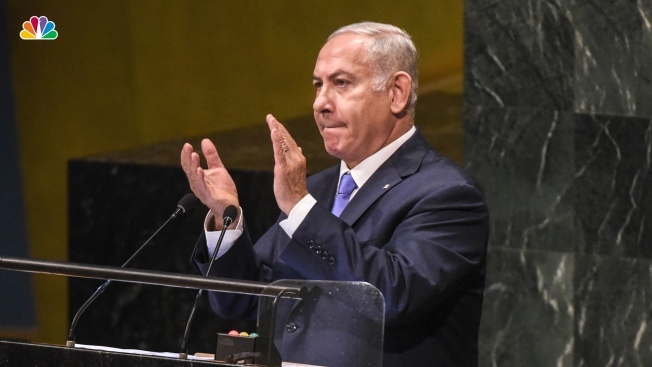 The recommendations nonetheless plunged Israel into uncharted legal waters, marking the first time in its history that a sitting prime minister is so close to facing criminal charges. While Israeli prime ministers are not required by law to resign if charged, the prospect of a prime minister standing trial while simultaneously running the country could increase calls, even from his allies, to step down. Former Prime Minister Ehud Olmert, who spent time in prison for corruption, stepped down a decade ago, months before police completed an investigation against him. As opposition leader, Netanyahu called on Olmert to step down before his indictment, saying he could not devote his full attention to governing. Netanyahu has a solid base of hard-line, nationalist and religious voters who are likely to rally behind him. For now, Likud officials and his current coalition partners are also supporting him. But polls have indicated that the upcoming vote, in which Netanyahu is seeking a fourth consecutive term, could be swayed by a small number of voters who abandon him in favor of a new centrist party headed by a popular former military chief, Benny Gantz. Those voters could well be turned off by Netanyahu's lengthy rule and never-ending scandals. Gantz, whose campaign has focused heavily on Netanyahu's character, late Thursday called on Netanyahu to resign immediately to deal with his legal problems. He said Israel could not afford to have a "part-time prime minister." "Let's imagine our reality when the prime minister needs to divide his time between court and dealing with the critical issues facing the state of Israel," he said. Even before Thursday's announcement, Netanyahu's campaign had shown signs of trouble. The alliance formed by Gantz and Yair Lapid, another centrist leader, has been welcomed by voters. Their "Blue and White" alliance enjoys a slight lead in opinion polls, making them the first credible threat to Netanyahu's decade-long rule. Lapid also called on Netanyahu to step down. "This is a sad day for the state of Israel," he said. "If Netanyahu loves the state of Israel as he always says he does, then he needs to do what's best for the country. He needs to resign, immediately." Netanyahu has also come under fire, both in Israel and abroad, for forming a partnership with the political heirs of an ultranationalist party that was banned for its racist views toward Arabs. The campaign now appears to be morphing into a referendum on Netanyahu as he seeks to become the longest-serving premier in Israeli history. Netanyahu has been prime minister since 2009 and served a previous term between 1996 and 1999. Netanyahu had previously tried unsuccessfully to persuade Mandelblit to delay publication of his recommendations until after the election. And on Thursday, the Supreme Court rejected an attempt by the Likud Party to block publication. The most serious allegations against Netanyahu involve his relationship with Shaul Elovitch, the controlling shareholder of Israel's telecom giant Bezeq. In exchange, they believe Netanyahu used his connections with Elovitch to receive positive press coverage on Bezeq's popular news site Walla. A related charge against Netanyahu's wife, Sara, was dropped. Mandelblit's statement said there was a unanimous opinion among investigators that the relationship between Netanyahu and the Elovitches was "give or take," constituting bribery. Mandelblit also filed breach of trust charges in two other cases. One involves accepting gifts from billionaire friends, including over $300,000 worth of champagne and cigars from Hollywood mogul Arnon Milchan. The second revolves around alleged offers of advantageous legislation for a major newspaper in return for favorable coverage. Mandelblit's office said the timing of Netanyahu's hearing would be set in the near future in coordination with the prime minister's lawyers. President Donald Trump, with whom Netanyahu has forged a close connection, offered the Israeli leader a boost earlier Thursday. "I can say this: that he's done a great job as prime minister. He's tough, he's smart, he's strong," Trump said in Hanoi, where he was holding a summit with the leader of North Korea. Yohanan Plesner, a former lawmaker who now heads the Israel Democracy Institute, an independent think tank, said he does not expect any dramatic changes in voting patterns, but there could be small enough shifts "that can actually make the difference." Plesner said from a "practical standpoint," Netanyahu should step down due to the severity of the charges. "But this will probably not happen," he said. CORRECTION (Feb. 28, 2019, 1:05 p.m. ET): An earlier version of this story incorrectly stated that Netanyahu had been charged. Charges were recommended but a final decision will only come after a hearing.